The animated Raggedy Andy doll known as Rand Paul has been busy this weekend making lots of stupid platitudes about single moms and the war on women, which he insists — just in case you had any doubt at all — women are winning. Take a moment to soak in the clumsiness of Paul's assertion. He's admitting (more or less) that the GOP actually is waging a war on women, but that it's losing that war. 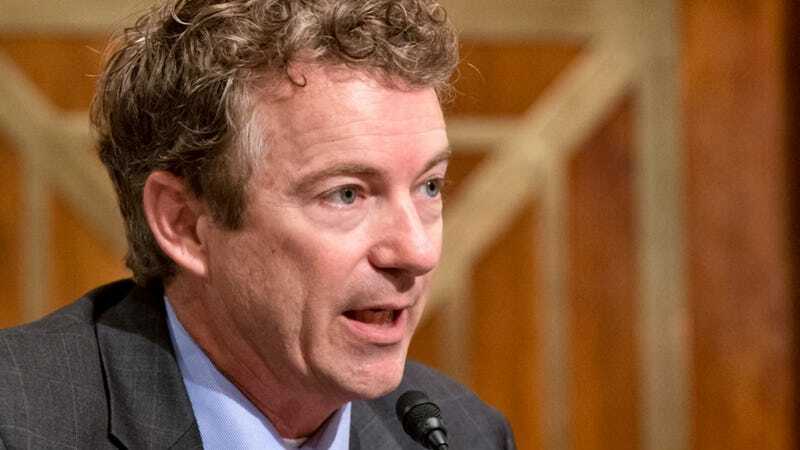 Did Republicans send Rand Paul out into the public eye on Sunday so he could surrender? Is that what's happening here? Because it sounds like maybe Paul could have used some better words (or no words). The whole thing of 'The War on Women,' I sort of laughingly say, 'Yeah, there might have been — but the women are winning it. Over half of the young people in medical school and dental school are women, law school the same way. I think women are doing very well, and I'm proud of how far we've come. And I think some of the victimology and all of this other stuff is trumped up. We don't get to any good policy by playing some sort of charade that somehow one party doesn't care about women or one party is not in favor of women advancing. That's some real nifty politicking, that is. It sort of feels like the GOP is giving up, like an old elastic waistband on a pair of sweatpants America's had since middle school. A hard truth about growing up, America — you can't wear middle school sweatpants forever.